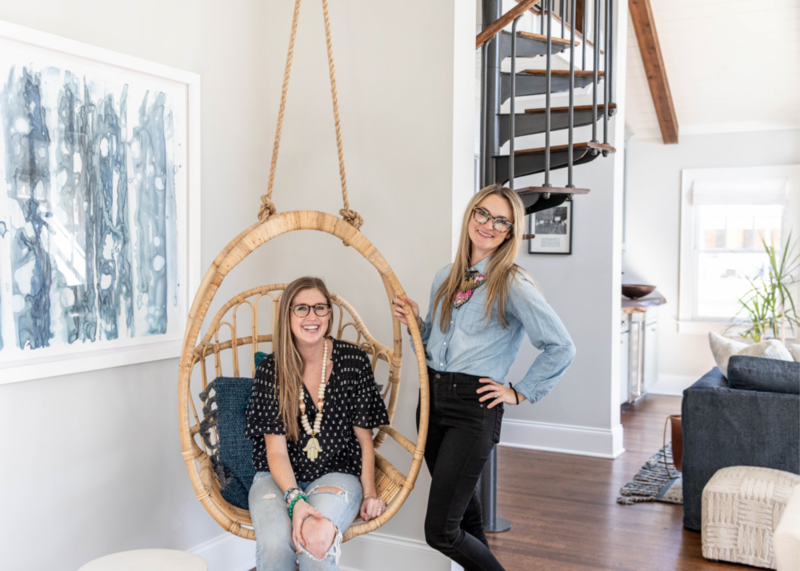 It’s no surprise that we are obsessed with hanging chairs! They add a relaxed, comfortable vibe to a space and tons of personality and we find our clients always jump for them, both for indoor or outdoor rooms! The trick for these chairs is mounting them properly to the ceiling. After trial and error by our install guru, Jim Drake, we’ve created a tutorial for the proper steps to hang these chairs — and have them stay put in your ceiling! Happy mounting! There is a lot of variety with what hardware hanging chairs arrive with — some come mounted to a rope or with a kit, some don’t include any hardware at all. A good place to start is this mounting kit. Whatever you do, purchase bolts/mounting materials rated for human weight and our suggestion is for 350-500 pounds, just to be safe. Make sure you have a stud finder on hand. You’ll need string/rope to measure chair height with (anything you have on hand will work!). Once you know the length (see step 4 below), go grab heavy-duty rope and/or a chain needed for your space and chair. The number one most important thing is that you get the eyelet screw (included in the above kit) into a stud or a ceiling joist. Studs are usually spaced 24” apart or so, but find the exact location with your stud finder and mark it. Warning: Some of the kits sold for ceiling mount say they can be secured to the drywall, but we don’t recommend going with that. You don’t want your chair to rip out of the ceiling with a glass of wine in hand! This means that aesthetically, you might have to play around with the feel of the space within a foot or so. But let’s be honest, safety is paramount. Sometimes there is not anything for the eyelet screw to grab into right where you pictured the chair. But don’t skimp on this step — the chair has to be placed in a ceiling joist or stud. Once marked, go ahead and drill your eyelet screw into the ceiling. To determine the proper length of chain or rope for mounting, try attaching a string or rope to the eyelet screw in the ceiling — or to the carabiner if you use the Amazon kit — and then to the chair. A trick is to put something under the chair to take off slack, so you can gauge how much length you are going to be using. An end table, nightstand or something similar is perfect for this step! Trick of the trade: Most chairs come with rope standard for an eight foot ceiling, but keep in mind — ropes have give to them! A common mistake is hanging the chair too low. A misconception here is that you hang it at seat level. But if you do, it’s going to sink about four inches when you take a seat. Once you figure out the correct length for the rope/chain, head to the local hardware store. They will cut chain down to the inch you need — and make sure it’s heavy weight bearing rope and/or chain. Using your carefully marked ceiling placement and custom-cut chain, and extra carabiners in your kit — get mounting and happy swinging! A special thanks to Jim, who passed along on these tips and hangs each and every hanging chair for our clients!